This shows the total rainfall to date and the percentage of normal. 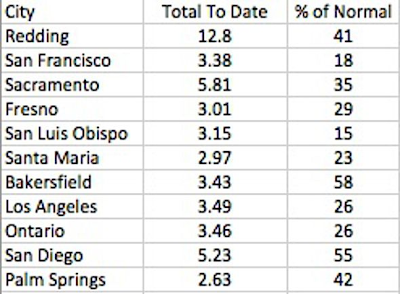 San Francisco is among the driest of the dry cities in California. Reno, Carson City and all of Tahoe are experiencing similar numbers. What looked like a decent December a few weeks back has turned dry, like the rest of 2013. Remember the snowy December of 2012. As soon as the year changed, so did the weather. And it hasn't changed back since! We continue to have a ridge of high pressure pushing storms east and north. That trajectory is never good for a major precip event. All of the models and now forecasters are pretty convinced that this pattern will remain in place through the end of 2013. I am starting to hop on that band wagon. 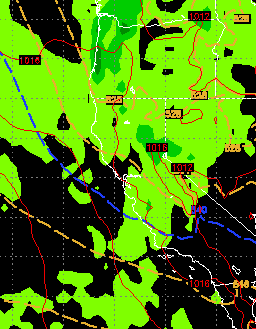 The EC weather model is forecasting around a 1/4 inch of liquid precip during our snowiest time of the year. Now the good news; The EC weather model is forecasting around a 1/4 inch of liquid precip during our snowiest time of the year. Yes, that is correct! This weather model along with the other other weather models have been consistently wrong the entire year. When EC has predicted something, long term, the exact opposite has occurred since last January. The exact opposite of no snow is lots of snow. I will keep an eye out and continue reporting to my faithful readers. In the meantime, do not lose hope, not all is lost ... our snow will come, hopefully sooner rather than later. There is a lot of cold air coming our way. We will get our first taste of winter starting on Tuesday. The leading edge of this cold air looks to be our best chance of snow for the next 10 days or so as our very dry pattern continues. High temperatures will not reach freezing on Wednesday and will probably not climb out of the 40's for a couple of weeks. That is the bad news. The good news is the 30 day still looks pretty good. Starting around 12/11 we should start to see the storms make it to our area. EC has been pretty consistent on this December event so keep the faith. Of course around the 10th, you cold wash your car ... that may help too. 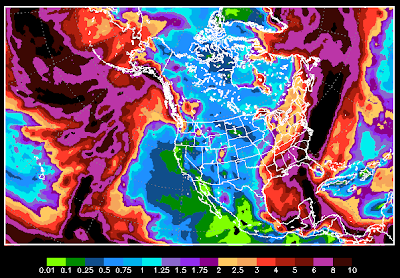 Here is a look at the 30 day total precip; remember this is liquid precip. With the colder pattern this could translate into quite a bit of snow by the end of the month. Again, we should see storms showing up on the short term weather models in about a week and the fun could get started around the 11th of December. The potential exists for a similar event to what we are experiencing now. This is a much larger storm than anything we have seen this year. 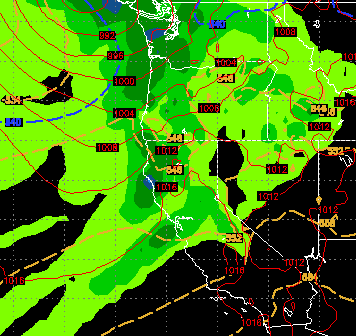 It is projected to make shore in Washington and send heavy precip all the way down the coast to from Northern Washington to Southern California. Ok, that extended golf season I promised did not disappoint. We had a beautiful stretch of weather that looks like it will come to an abrupt halt with the seasons first major winter storm next week. 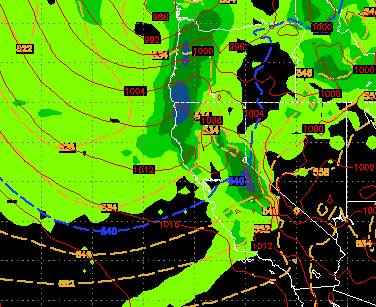 First I will talk about the storm or storms, and then I will caution you as I am only showing the GFS model. 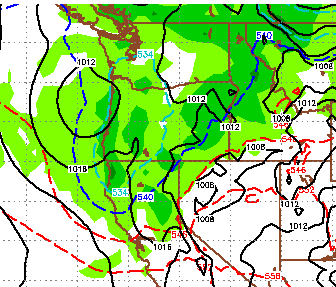 With few exceptions, October should be a beautiful month in the Reno/Tahoe area. I know we received a few teaser storms, but all that snow will melt. Looking at the long range forecast, I am not seeing any major storms developing and coming to our area, possibly through October. Having said that, what about the upcoming winter? How much snow can we expect? I have read numerous articles trying to predict the long range forecast. The only thing they have in common is they have nothing in common. I have heard of a weak to moderate El Nino (aint going to happen, at least not until spring) and a weak La Nina (slight chance). My guess is we will stay neutral ENSO until at least late January. Therefore the El Nino Southern Oscillation is not going to provide us any guidance. I have been asked by some of my loyal readers to give a smoke report for the Reno/Tahoe/Carson area. It seems the local weather people are unwilling to commit to anything. Since I do not get paid to do this, I will tell you what the models and wind forecasts are telling me. We have been in a straight southerly flow. That means our winds are straight out of the south. We are due north of the Rim/Yosemite fire and the wind has made a beeline to our area (DA!). This has been a pretty amazing season. 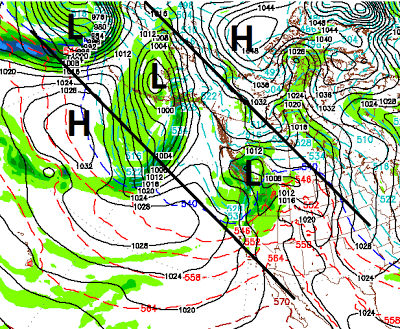 We started with what looked like a moderate El Nino which lead to an epic start of the season. Then the spigots were turned off, literally. Storms kept forming and approaching and dying. The weather turned warm and calm for much of the spring. Then summer showed up and the temps dropped off the table. The simple answer is that nature is unpredictable. Even this time of year. Many years we struggle to get into our summer weather pattern. What makes this year different is the mild spring temperatures. Most readers thought Ma Nature was done until next fall. 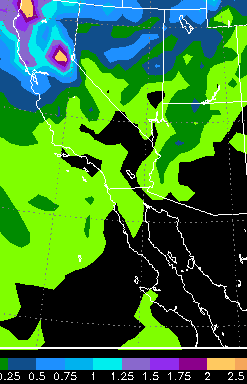 As can clearly be seen, West of Tahoe is in the 10+ inch range and the Carson range is in the 8-10 inch range. 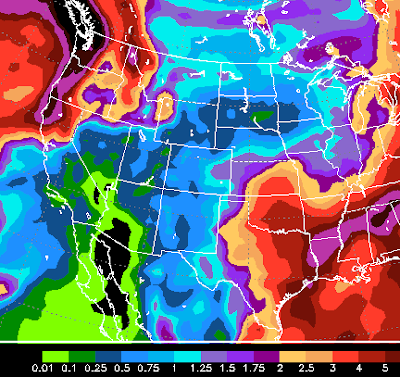 Remember this is liquid precip. 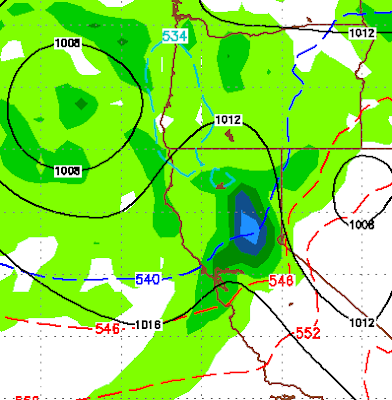 We could be looking at a major weather event for the higher elevations of the Sierra and Carson Range. The fun should begin around the 1st of April. 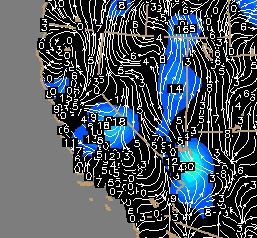 Here is a look at the forecast, notice the storm is off the coast and the leading edge is pulling in precip for the entire state of California. As is often the case, when the weather models are in wild disagreement, our hopeful forecasts whiff. Our potential for a foot or more of snow last week, faded into the weeds as both storms weakened significantly and only left behind 2-4 inches. Our next hope was for the first week in March. My good friend, Sven, over at Unofficial Mt. Rose sent me an interesting tidbit from NOAA. That tidbit talks about conditions ripening in that first week of March. That sent me back to the models and lo and behold, the two most accurate models are now focusing on what looks like a decent snow event for around the 6th or 7th of March. In addition, both models are looking for another event about a week later, March 14th. Beautiful weather for the weekend will turn into a series of storms heading our way for next week. The pattern change will begin on Tuesday and last through the weekend, at least. 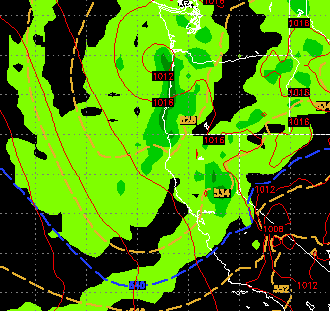 These systems will bring in much colder air but the models are in stark disagreement with the amount of moisture headed for the Sierra. We will focus on the more consistent EC model. Below are a series of forecasts for what I would call chances for moderate snow in the Sierra on Tuesday night, Friday and Saturday. 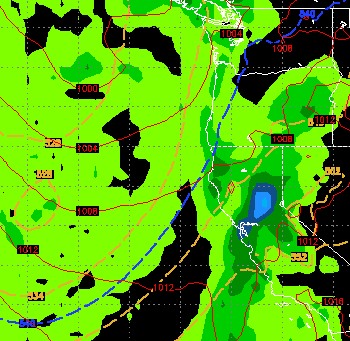 These storms together could bring as much as 1-2 feet of snow to the Sierra and Carson range. They will also bring much cooler temps and much windier conditions. Remember, the EC model is the most aggressive. 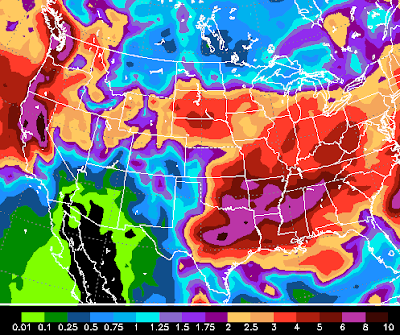 The GFS, which has been the least reliable model for a couple of years now, is predicting much less precip. This little storm that has been producing light snow showers has certainly shown more gumption than I thought it had. 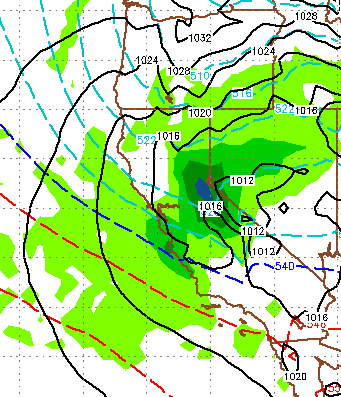 Having said that, it will only leave a few inches of snow behind in the Sierra and only at the upper elevations. In my last post I talked about a cold front heading our way for Sunday. We are still on track for that storm and I am hoping that we can squeeze 4-8 inches out of it by Monday night. 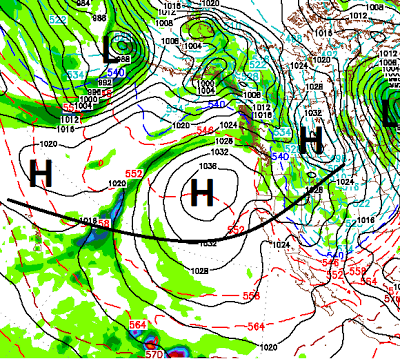 Then high pressure moves in. Here is a look at Wednesday the 30th of January. 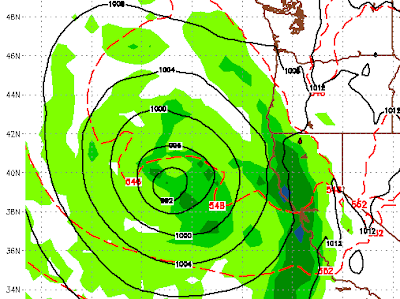 As you can clearly see, high pressure will be dominating the entire west coast. The storm for Sunday will usher in some much cooler air, but that cooler air will be short lived. For you hockey players that are looking for frozen lakes, the short term does not look great. You may be able to squeeze in some ice time Monday through Thursday of next week ... but that may be pushing it. 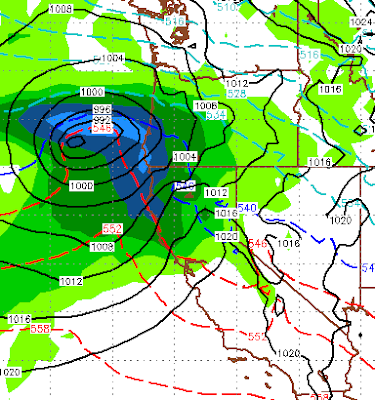 Take this with a grain of salt; the weather pattern will change in about a week from today (1/27). At that time conditions will ripen for a series of storms to come into our area. Here is a look at the first storm, which right now appears to be the best chance for some precipitation. 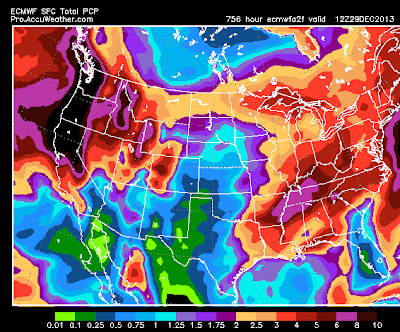 The two images reflect about 12 hours of precip that should be coming our way next weekend.